Whether you play in fantasy baseball leagues for money or for fun, it is important that you pay attention to which players were drafted highly in real-life fantasy baseball leagues. That’s because there is a correlation between the two. 14 of the 17 starting pitchers drafted highest in Yahoo! fantasy drafts this season were selected in the first round of Major League baseball’s June amateur draft. Two pitchers – Felix Hernandez and Yu Darvish – were international pitchers not subject to the draft. The only pitcher in the top 17 who was drafted outside of the first round was Cliff Lee, who was a fourth-round pick of the Montreal Expos in 2000. Two top-rated starting pitchers were first-overall picks (Stephen Strasburg, 2009, and David Price, 2007). Justin Verlander was picked second overall in 2004. But being drafted first or second does not guarantee stardom. The three other pitchers picked first or second from 2002 to 2007 were Bryan Bullington, drafted first by the Pirates in 2002, Luke Hochevar, drafted first by the Royals in 2006 and Greg Reynolds, drafted second by the Rockies in 2006. And it’s not as if 2006 was a weak year for pitchers - Clayton Kershaw (drafted seventh by the Dodgers), Tim Lincecum and Max Scherzer were all picked in the top 11. Six of the top-rated 14 were top-ten picks (Verlander, Kershaw, Strasburg, Price, Madison Bumgarner (drafted tenth by the Giants in 2007) and Zack Greinke (drafted sixth by the Royals in 2002)). Five of the 14 were picked in the second ten – Jered Weaver, Angel s (2004, 12th pick), Chris Sale, White Sox (2010, 13), Cole Hamels, Phillies (2002, 17), R.A. Dickey, Texas (1996, 18) and CC Sabathia (1998, 20). Matt Cain was drafted 25th by the Giants in 2002, Adam Wainwright was drafted 29th by the Braves in 2000 and Gio Gonzalez was a supplemental first-rounder, going 38th to the White Sox in 2004. Five other pitchers picked in the top 30 starting pitchers in Yahoo! fantasy drafts were first-rounders: Roy Halladay, Toronto (1995, 17), Scherzer, Arizona (2006, 11), Brandon Morrow, Seattle (2006, 5), Lincecum, Giants (2006, 10) and Ian Kennedy, Yankees (2006, 21). In 2013, breakout young pitchers Matt Harvey of the Mets (2010, 7) and Shelby Miller of the Cardinals (2009, 19) were drafted in the first round. Mike Minor went seventh to the Braves in 2009. 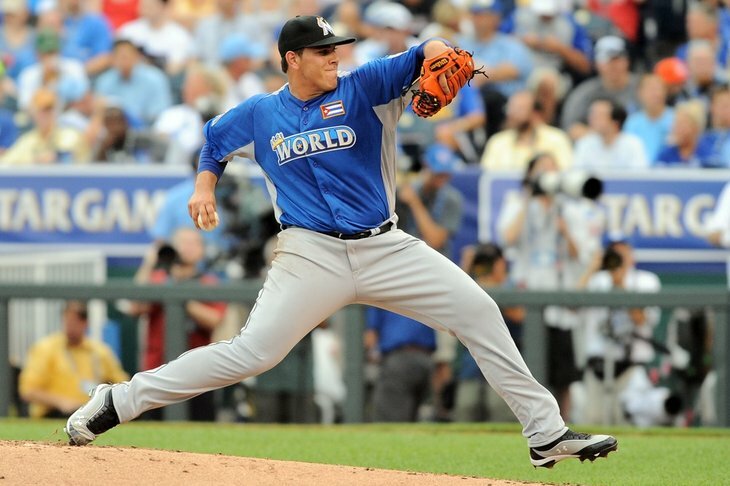 Miami rookie Jose Fernandez was drafted 14th in 2011. Trevor Bauer, now with Cleveland, was drafted third by Arizona in 2011. In late May, Baltimore called up Kevin Gausman (2012, 4), St. Louis called up Michael Wacha (2012, 19) and Arizona called up Tyler Skaggs (a supplemental first-rounder drafted 40th by the Angels in 2009). Ben Hargrove writes on fantasy baseball leagues for money topics for sites like DraftStreet.com. Football: Michael Floyd 2013 Sleeper?